Put in low-flow faucets and shower heads: These fixtures reduce the amount of water used by a significant percentage while still providing plenty of water for normal use. Install water filters at faucets and shower heads: Improve water quality and safety with filters that remove chemicals and other substances. Put in high-efficiency toilets: Newer low-flush toilets can reduce the amount of water used per flush by 200 percent or more while still providing excellent sanitation. Install radiant heating: Radiant heating is highly efficient and can provide better comfort, particularly in the bathroom, than forced-air heating. Insulate plumbing pipes: Make sure all plumbing pipes, especially those coming from the water heater, are properly insulated to prevent heat and energy loss. Replace the water heater: Install a newer high-efficiency water heater. This might include a tankless model or low-cost water heating connected to your heat pump. Replace lead plumbing pipes: Any older lead plumbing pipes can be a potential source for lead poisoning. Replace these pipes with copper, steel or plastic. 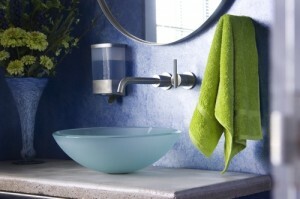 Remember ventilation: Design your project to allow sufficient ventilation in the bathroom. Proper ventilation improves indoor air quality and removes moisture that could cause mold growth. Use low-VOC paints, sealers, adhesives and finishes: Choose building materials that don’t contain volatile organic compounds and don’t off-gas potentially harmful fumes. Install water-resistant flooring and wall coverings: Use floor and wall coverings that don’t absorb water and moisture. Avoid materials such as carpet and wallpaper. Sage Builders, LLC is a general contractor in Newton, MA. Contact us today for more information on the benefits of a green bathroom renovation and how to improve the energy efficiency of your bathroom facilities. Previous PostHow Does Using Solar Power Help Massachusetts Homeowners Save Money?